A few days ago, I was listening to the song, “Click Clack” after a few friends had come to visit me for the weekend, and we had spent a great deal of our time drinking together. The lyrics “Sometimes drinking I feel so happy but then / I can’t remember why / I feel sad all over again / Sometimes drinking I / don’t know my best friend for my best friend,” felt especially poignant to me because of the terrible emotional and psychological hangover I was going through. To what extent do you think alcohol (and other substances) have helped or hurt your creative process? It was really hard to tell because sometimes I used to think drinking and smoking weed were a way I could get into a head space where I could write. I almost didn’t have the confidence in myself to believe what was happening when I was creatively inspired could be achieved without altering my consciousness chemically. It’s like when you’re learning to swim, you think you still need flotation devices, and you don’t want to test yourself without them. For a few years, I sort of assumed smoking weed and drinking would be necessary for song writing. Even though I was usually only doing that in moderation, I think using those substances revealed an inhibition, and they can help you overcome your inhibitions. It’s the idea of thinking you need a crutch even when you don’t need one, but some people do need a crutch. There is real medical value in some of these things, but there needs to be balance. I don’t think I have a final conclusion about the value, or lack of value, of these substances in my practice; sometimes they seem to relax me and be conducive to work, and other times they drain me of energy, make me paranoid, and so inhibited that I don’t work. It’s almost like they enhance things when they’re going well, and exacerbate things when they’re not going well. I think these substances are interesting things, they have a unique phenomenal value in the world, they aren’t things you want to lean into completely, or treat with reckless abandon, or without thinking about how you’re using them. You talked briefly about balance, do you have any habits or rituals that help you find the balance or head space you need to write a song? I think rituals and routines have a powerful aspect to them, they aren’t just empty motions, well, I mean, that is the whole thing about them, they are just empty motions, but they do unlock, or change your mental focus. I don’t know how often I put rituals into place consciously, but I think I’ve been lucky with unconscious rituals like finding solitude, and just breathing. It’s strange because sometimes when things are going really well, when I feel balanced and rooted in my life, I find that’s when I’m not necessarily writing the most songs. Can you talk a little bit about the way a song grows from it’s original conception? I really haven’t been able to do that many special or skillful things in terms of melodies on guitar, or unusual chords. So I’m often playing the basic things with the idea that they can be the groundwork, and that the band can add complexity because Seamus, Josh, and Brad are all very skilful players that bring a lot to the arrangement of the music. If you capture the basic essence of the song, then a lot can be added to that. If I try to prioritize and use some really smooth, interesting riffs, or melodies and chords that are outside the basic thing that I can do—if the essence of the song isn’t there—then it won’t amount to much. There might be some surface interest, but the deep root of the song won’t go that far. On the other hand, that line of thinking can make me reductive, and cause me to miss the point of something, or some beautiful subtlety of instrumental playing. My approach can be a bit crude sometimes, and because of this collaboration is an amazing gift for me. It might be something like a writer who is great at getting their creative vision out there, but they might benefit from an editor who has a keen eye for presentation. 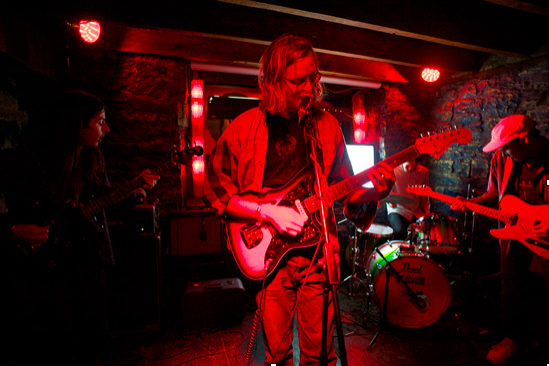 Nap Eyes is known for recording their albums live and without overdubbing. Does capturing “the essence” of the song help inspire some of the spontaneity you guys are known for when you play and record? I think that’s the benefit of capturing the core of the song, there’s more room for change, for improvisation, even the energy, the loudness and quietness, the different melodies can change a lot from performance to performance, and, if you have the essence of the song, it still feels like a true performance. That’s one of the most enjoyable parts of being in this band, we can sort of feel it out, and play to the room, or the crowd’s mood. The song is like a vehicle, a vessel for you to put your energy and feeling into, and that can change a lot from time to time; it’s nice to not be so rigid. Sometimes this experimentation can cause a bad performance, but that’s also part of the fun of it. When we record our songs live we also try to bring some variation to the process while we’re performing for the microphone. I read an interview where you quoted William Blake, and also that the title of the album Whine of the Mystic was inspired by the The Rabaiyat of Omar Khayyam. Are there any other literary figures who have inspired your work? I definitely feel inspired by writers in both writing songs and living life in general. I’m a big fan of reading novels; I think it helps to reframe your mind, and reframe your life perspective. Novels help remind you of the great, tremendous value of human existence, and they help give you that sense of wonder if you’ve fallen into a mundane, or dry way of thinking about life. In general, writers influence me a lot. Lately I’ve been reading an anthology of classical Chinese poetry, and those poets have an amazing tradition. Their perspective is reflective, and often solitary, but only solitary because they need distance to consider the importance of society. I’m also a huge fan of German writers like Herman Hesse and Thomas Mann. I really like Tolstoy, but it’s hard to pick just a few because my favourite writers are always changing. Would you mind if I gave you my interpretation of the title of your most recent album, Thought Rock Fish Scale? I’ve been thinking a lot about the multiple implications in this title. Musically, obviously we have Rock and Scale, and spiritually the Thought Rock strikes me almost as a kind of altar, or place for meditation. Fish Scale generated three images in my mind: a fish’s scales, a scale used to weigh a fish, and a prehistoric fish scaling (or climbing) its way out of the ocean. All three of these images seem to relate to scientific principles and theories like classification, categorization, and evolution. One of the things I find interesting about your work is the way your music meditates on the relationship between science and spirituality. Through all your work as a biochemist, exploring the world in microcosm, and your work as an artist, thinking philosophically about the cosmos in macrocosm, I have to ask, do you feel a spiritual force within the universe? Yeah, for sure, even just talking now and sitting here, there is a lot of phenomenal things to be experienced. There’s a conscious mind, and crazy things like weather outside, cycling seasons, there’s a planet, and it’s a planet within a solar system which spans many millions of miles, and that’s within a galaxy with billions, billions of other stars, and that’s just one galaxy among many more millions, or billions, of galaxies that are all spiralling, expanding, and moving all with some kind of apparent origin billions of years ago. But what that origin means philosophically is sort of impossible to grasp. And because [this perspective] has been gradually uncovered by the scientists, astronomers, physicists, and biologists, we can view life evolving around us as a really profound miracle, you know? It’s crazy…it’s really crazy. When I think about spirituality I definitely don’t think of some grey-haired giant or anything, but if you want to think of it that way. . .well religion comes from a very well-grounded, sensible place, a place of wonder and mystery about existence, and yeah I feel my own spirit, I feel the spirit of others, and the natural world. I’m skeptical of the logical basis of anyone who claims to have a concrete conception of something that’s outside of their own phenomenal experience. I think the same way about the scriptural, authoritative perspective many religions preach. Scientists see religious advocates preach this perspective, and they say there’s no proof, no evidence, therefore that whole system is crazy. If you’re just thinking about facts, names, classifications, and orders of magnitude—you could know all the facts—but who is the knower? And what is their context of knowing? Any scientist who thinks that they have figured it out, I would say that they should take another look. But I would say the same thing to any religionist because they say that they know that god said this, and that this is the law. I don’t know, it just seems like these spheres of religion and science aren’t mutually exclusive, but they do need to learn from one another I think. I’ve heard you talk about how you have a tendency towards self-doubt, and overanalyzing your work. How has your recent success affected these issues? On one level, my existential doubt and fear of the universe causes me to talk about wonder, but I also talk about fear, confusion, pridefulness, my ego, and my fear of the destruction of my ego, which is inevitable, all these things cause my anxiety to manifest in many different ways. If one did have it all figured out, they wouldn’t have to wonder: am I good artist? Am I a good writer? Does my work have value? All these questions, from a different perspective, would seem like self-preoccupation with things that aren’t really important in the grand scheme. It would be a goal to not have to ask myself those questions but unfortunately getting material success and appreciation from fans—while these things are immensely helpful—they can’t dispel that doubt, that existential angst. But I think in one way or another everyone has to confront these doubts, either by a kind of trial by fire, or, more directly and personally, by some sort of spirit quest. I think that kind of quest is separate from success and failure in life, or certainly success in life won’t solve that existential angst for you. So, that being said, when people did start to get interested in my music and say nice things about it, that made me feel happy, as an artist, I’m seeking that sort of validation from the outside world. Because I am as insecure as I am, it means so much that people I don’t know would kindly say these things, and financially they’ve given me the prospect of being able to play music for a living, which helps me not feel unsure about how to spend my time. Before, when I’d be working at the lab, I’d say, “Am I spending too much time on music and not enough on science?” Then when I’d be working on science I’d be frustrated because I didn’t have enough time for music. Do you have any advice for young artists who are struggling with the same problems? For young people, if you’re serious about life—and I don’t mean morose and somber—but if you take life seriously, and try to do it justice, then life is very hard. That said, a lot of things have been very easy for me, material privilege, societal privilege, economic privilege, and these advantages are important for people like me to recognize because it’s only through that recognition that people will feel compelled to try to help others who haven’t had the same opportunities. I think a lot of privileged young people acknowledge that their struggles are not as severe as others, and therefore they start to believe that they don’t have anything meaningful to say. But, like I said before with life, every artist who takes art seriously is going to have self-doubt and anxiety about the value of their art, and that’s nothing to worry about—just keep on doing it—the dividends are so profound, and real in terms of gaining an understanding of life and finding a sense of meaning. Creativity is so important. As an artist, you may feel selfish and solipsistic—being an artist is selfish in a sense—but your art will help other people because people need art, it’s inspiring. In a way you’re sacrificing yourself for other people. (Laughs.) I don’t mean to make it sound so noble. But, I don’t know, my friends and I have these thoughts all the time. We ask ourselves, “Are we just taking up space and resources? Why can’t we just do something nice for people instead of something that’s so self-indulgent?” Yeah, it’s a paradox. Carter Selinger is a Vancouver-based writer.